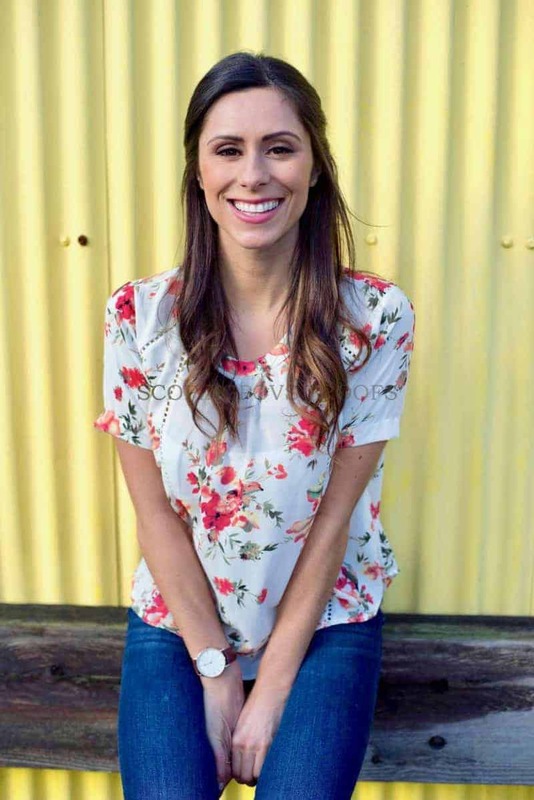 I’ve heard it 1000 times but before we address this common misconception, let’s review why preparing and eating a healthy breakfast is a huge key to dropping pounds and feeling your best. When you start your day with a healthy breakfast, studies show you are more likely to continue to make decisions that support your goals throughout the day. Start your day with a croissant and vanilla latte…. a burger and fries for lunch doesn’t seem so far fetched, cuz hey you’ll start fresh tomorrow right? 2. More time staying energized and focus= Less time thinking about the plate of streusel in the break room. When you fuel your body properly, it won’t feel the necessity to signal you to keep searching for energy elsewhere. Our brain needs nutrients and sustainable energy in order to stay focused. When our blood sugar is down, we crave simples carbs and sweets for a quick and easy pick me up. If you start your day with a simple carb and/or a high sugar food, it spikes your blood sugar only to have it come crashing down an hour or two. This leads us back to square one, hungry, low energy, and unproductive. A continuous rise and fall of blood sugar could eventually lead to type 2 adult onset diabetes. Moral of the story… having a balanced breakfast each day keeps the hangry sweet cravings and diabetes away. Starving yourself in the morning is no way to rid binging and weight gain. You may be thinking skipping breakfast will lower your daily caloric intake. Which, may be true to some degree if you’re a goddamn saint and are able to not overeat and binge come your next meal. But for the rest of us normal folk, highly unlikely. 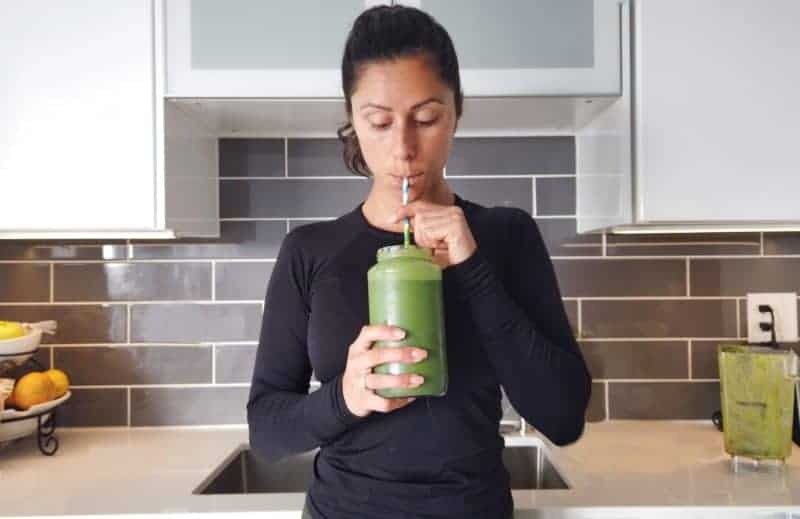 When you have prepped a healthy breakfast, like the smoothies in this video, the decision to eat clean first thing, has already been made. No self-banter and playing the ‘should I? Shouldn’t I?’ game. The fewer decisions you have to make around your diet in a day, the better. Fewer chances of overeating, making last-minute hangry decisions and less will power used. Save that for the end of the day when your partner wants to have a mid-week ice cream affair. Wash, chop and peel (lemons & oranges only) the produce. In 3 ziplock bags evenly distribute the oranges, avocados, lemons, and 1 of the zucchinis. This is your Green Detox smoothie. In 2 zip lock bags evenly distribute the apple and other zucchini. This is your Cinnamon Crunch smoothie. Place all chopped spinach in the last ziplock bag. 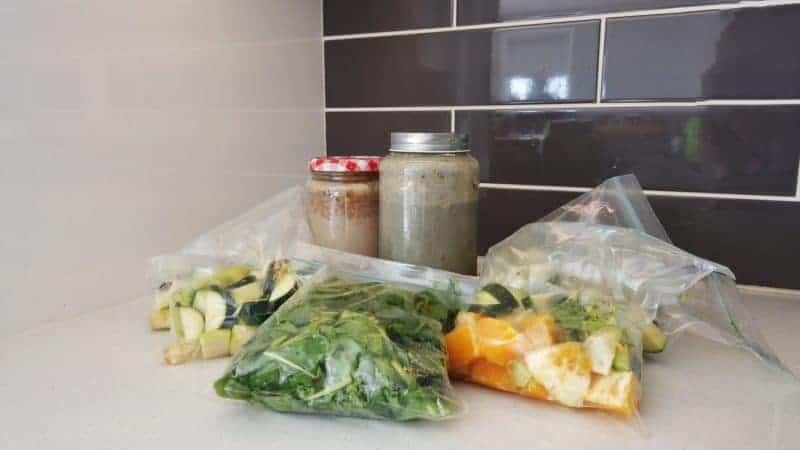 Place all ziplock bags except the spinach into the freezer. 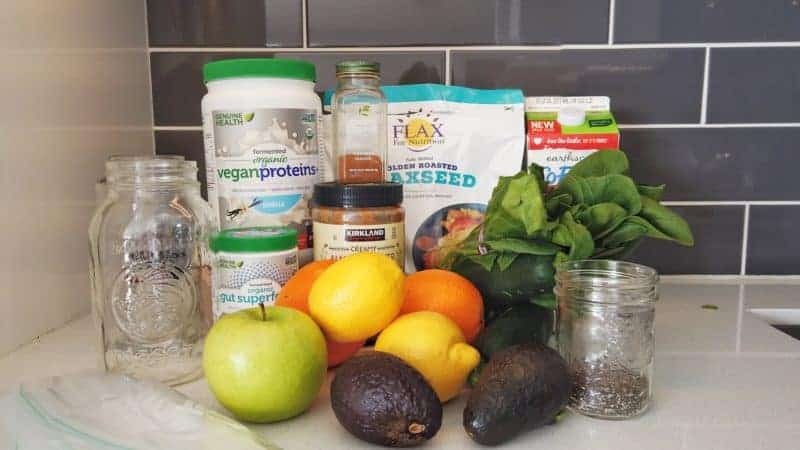 Prepare the Green Detox liquid by placing ⅔ of the non-dairy milk in 1 mason jar. Add the remaining milk in the other mason jar for the Cinnamon Crunch liquid. 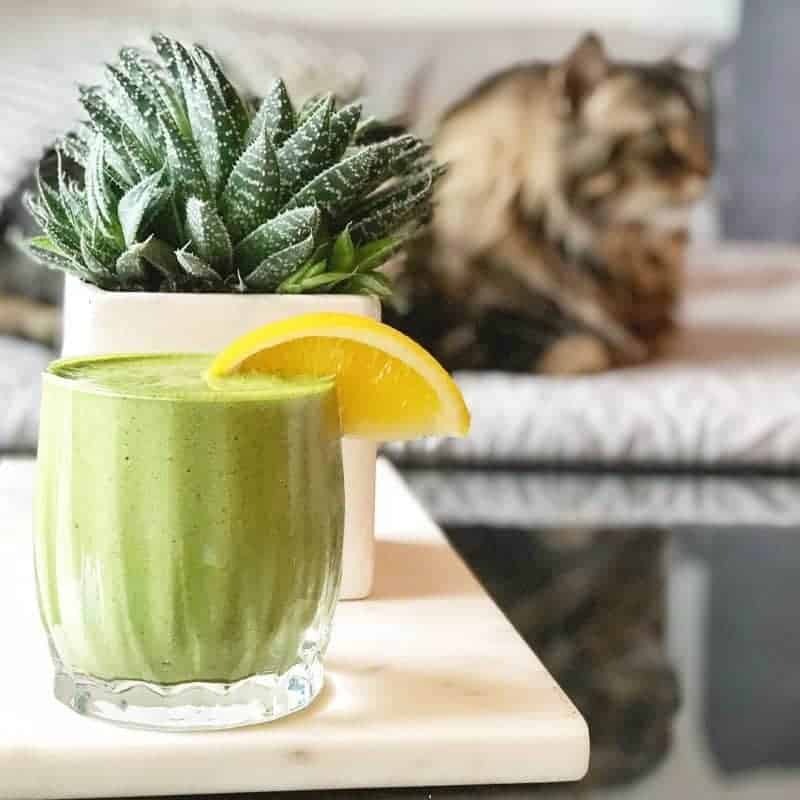 In the Green Detox liquid add 3 scoops of protein and 3 tbsp of ground flax seed. In the Cinnamon Crunch liquid add 2 scoops of protein, 2 tbsp of chia seeds, 2 large tbsp of almond butter and 3-4 large dashes of cinnamon. Place lid on both mason jars and shake well. Store both mason jars in the fridge. 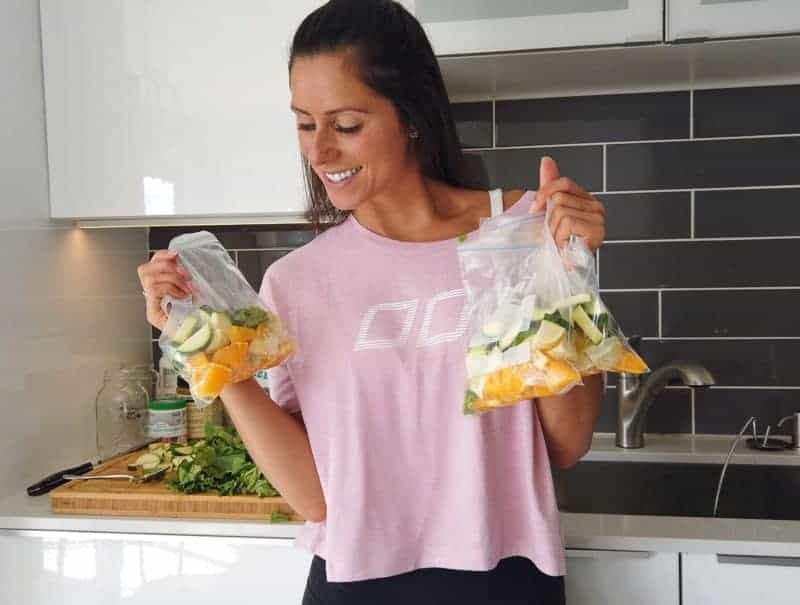 Empty your ziplock bag of choice into the blender. 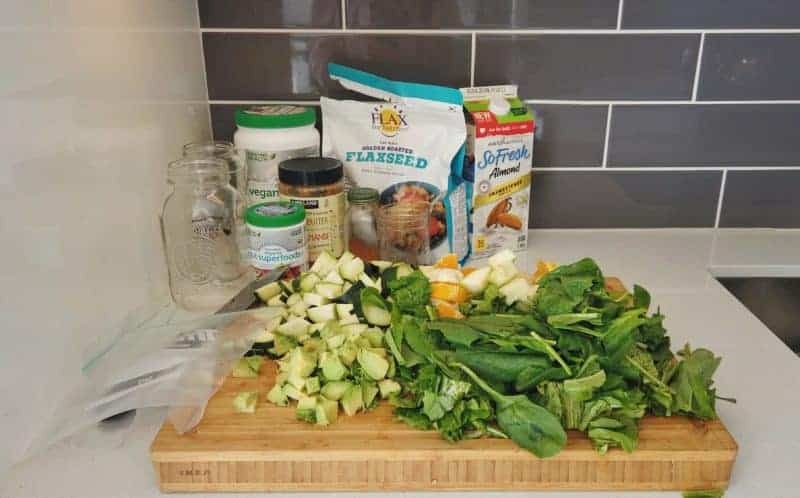 Add ¾ cup of the corresponding liquid to the blender along with a handful of spinach (and a splash of water if you prefer your smoothies not as thick). Pour into glass, mason jar, to go up, bowl…however, you choose to sip away! Want to get creative and prep different smoothie recipes but don’t know where to start? Click here to learn how to Build A Weight Loss Smoothie. Click here to watch the vlog!